Comic actor, Bolaji Amusan, aka Mr. Latin, has explained what motivated him to go back to school despite shooting to stardom. 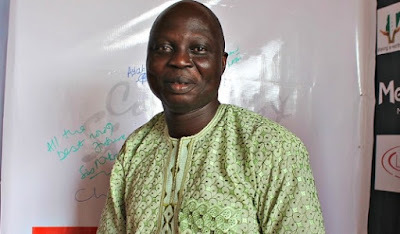 35 years after he completed his secondary school education, he is now an undergraduate at the National Open University of Nigeria, where he is studying Peace and Conflict Resolution. He told Sunday Scoop that if he had been well educated, he would have gone far in the entertainment industry. “John Okafor and others are fantastic actors and comedians, but they are not better than us. They are just fortunate to be speaking a universally-accepted language and they are all graduates too. So, if I can add a little bit of education to my profile, I believe I will go places. That has been my determination and I am working towards it,” he stated. He went ahead to say that regardless of all that King Sunny Ade and King Wasiu Ayinde Marshal, aka KWAM 1, have achieved, the likes of Davido and Wizkid still have an edge over them. He said, “If KSA and KWAM 1 go to Uganda or any other country, the way they would be accepted will be different from the way Wizkid, Olamide and Davido would be accepted. According to Mr. Latin, most of his friends are now in high places in the government and other sectors, arguing that he might be called upon to work in any capacity some day. He added, “So, I don’t know what will happen tomorrow. I may be fortunate to venture into politics or I may be fortunate to have a friend in the Presidency, who is passionate about the theatre and thinks I can be of help. But if I don’t have a certificate to back it up, I will not be able to do it. He stated that he had realised that without education, one’s achievement would be limited, saying provided one was ambitious, there was a need to seek knowledge. » Mourinho explains why he dropped Hazard.